This past June, I was inspired to find my inner child and rediscover my love of My Little Pony . I learned that people have been making custom ponies for years now, and it got me thinking about making one of my own. At first, I thought about making an Aayla Secura pony (that turned out to be harder than I thought). Then I had another idea… why should I make a pony for myself, when I have an entire group of great women who would love to share her with me? I set out to bring to life a little pony for our team to share. Her mission will be simple…to share our love of everything geeky with the world. Traveling from writer to writer, her stories will be something fun we can all enjoy writing and reading about. From conventions to theme parks, there’s nothing that this little pony won’t do. So without further ado, I’d like to introduce you all to the newest member of the GeekMom team. Except there’s one problem — she doesn’t have a name! Now, it’s up to you! 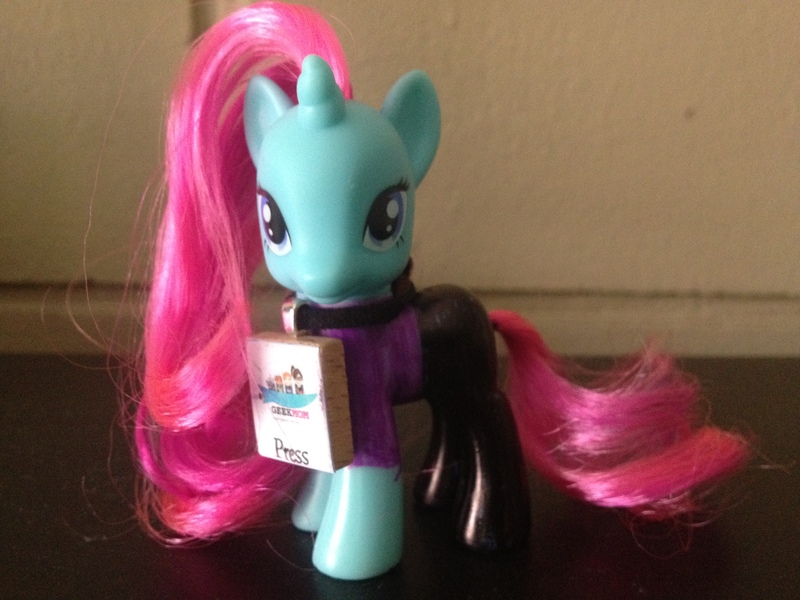 We need to name the GeekMom pony. Between now and Monday, August 13th at noon, leave a comment with what you think we should name her. On Monday, we will select five names by random and then vote on them behind the scenes. The winning name will be announced on Wednesday, August 15th. The person who suggests the winning name will receive a GeekMom T-shirt. So what are you waiting for? Lets name that GeekMom pony! !